Cadbury Egg Cupcakes are giant vanilla cupcakes stuffed with delicious Cadbury creme eggs and topped with a creme egg laced frosting. 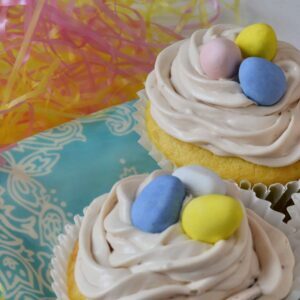 The perfect Easter cupcake idea! Prepare boxed cake mix according to package directions or make your own homemade cake mix. Preheat oven according to package directions. Line cupcake pan with extra large muffin liners. Fill each half way. Unwrap 16 large, frozen Cadbury Eggs and set one into the center of each liner. Spoon another tablespoon over the top of each egg to cover. Bake according to package directions. Due to the centers being hollow with Cadbury Eggs you won't need to bake for longer even though the overall cupcake is larger. Remove when tops are lightly browned and spring back when touched. Due to the center being filled, a toothpick test will not be an accurate indicator. Meanwhile, place the last 4 large Cadbury Eggs into your food processor. Pulse until broken into small bits. Add can of frosting and continue to pulse until combined. Frosting will turn a light gray color. Place frosting into a piping bag with a star tip and frost away! Top each with 2-3 mini Cadbury Eggs. Keep refrigerated to hold shape. Enjoy! If you've tried this recipe come back to let us know how it went!